Summary Value priced dual-bay NAS with single Gigabit Ethernet port. Powered by dual-core Marvell CPU. Last year, I reviewed the DS216, part of Synology's Value Series targeted at the Home/Workgroup. This review will focus on the DS216j, a lower-priced entry-level model targeted at home users. Synology's NAS Comparison tool currently shows six two-bay desktop models, two each in its "Plus", "Value" and "J" series. The chart excerpt below focuses on showing processor, RAM, ports and hardware encryption / transcoding features. The DS216, 216j and 216se differ mainly in processor and RAM. Only the DS716+II has two Gigabit Ethernet ports, all others have one. The image below shows the callouts for the DS216j front and rear panel. It was taken from the DS216j Hardware installation guide. You have to remove the case cover in order to mount the disks using screws on the DS216j. It's certainly not difficult, but some home users may not like disassembling the case. Most other Synology products have front panel access for the disks and have plastic mounting trays that don't require tools. But given the DS216j's lower price, the tray-less disk mounting makes sense. The table below shows the LED indicators key. The image below shows the top side the DS216j's board. 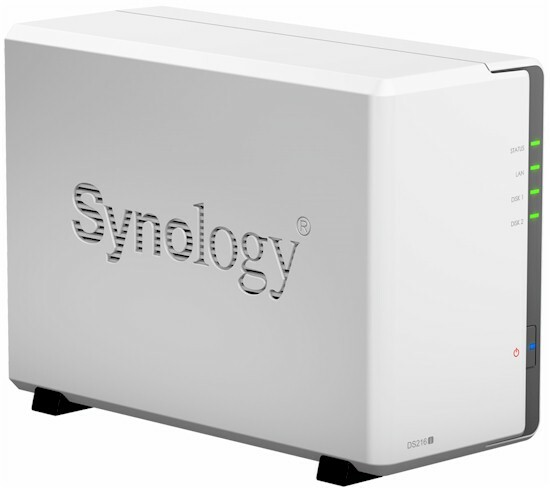 For this review, I decided to compare the DS216j with the Synology DS216 and the ASUSTOR AS1002T. All three products use a Marvell ARMADA-385 dual-core processor and 512 MB of RAM. You can see side-by-side feature comparisons for these three products here in the NAS Finder. When I reviewed the DS216 back in 2015, its Marvell SoC was clocked at 1 GHz; its current spec shows the clock rate at 1.3 GHz. I suspect this was done when the DS216j was introduced to continue to justify the DS216's higher price and provide a performance boost. The table below shows the key component summary for the selected products. The DS216j drew 17 W with two Synology-provided 2 TB Seagate NAS (ST2000VN0001) drives spun up and 7 W in power save mode with the drives spun down. RAID 1 rebuild was less than 10 minutes with the bad block check was skipped. Noise was rated as very low.